This post is based on information I started gathering and initially wrote up back in 2004 when I found a few brass replacement bodies for Nelspot 007s. 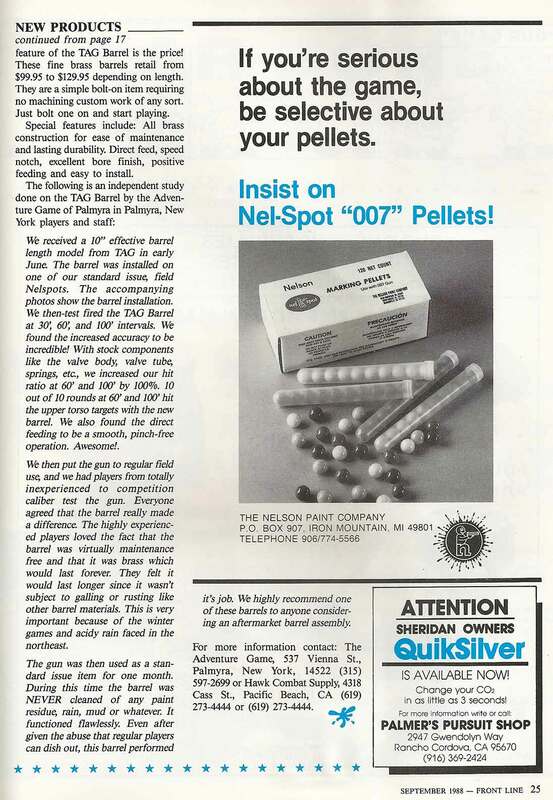 At the time I had seen ads from several companies offering similarly constructed brass Nelsons which peaked my curiosity and made me wonder if there was a link between distributors or a shared manufacturer. Right side of a Long Barreled Bore Drop Tag/Heckman/Performer Body kit. So over the last ten years I’ve scanned images I’ve come across and purchasing a few different models to help illustrate the differences. A close up of the Bore and Breech drop Brass Nelsons featured in the February 1990 issue of APG. Full ad for Adventure Games of New Hampshire’s line of Brass Nelsons below. Overall their are two main styles, the brass breech drop body version (stock 007 bolt) which is primarily labeled the Texas Air Guns (or Tag) body kit and the brass bore drop version (Bushmaster or Grey Spirit length bolt but with different outer diameters) which was distributed under various names. Texas Air Guns and the name of D. Heckman seem to run between several ads and articles for various distributors so I believe that Heckman was the person operating Texas Air Guns and selling the body kits to various retailers where they were then rebranded. The construction of the bore and breech drop bodies are nearly identical. 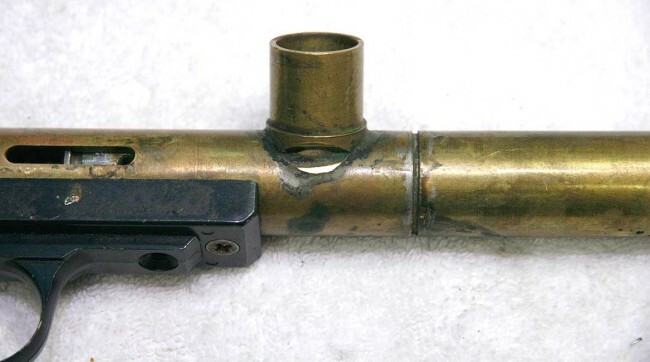 Both are made from an inner bore piece with an outer sleeve of brass soldered together, just past the breech. 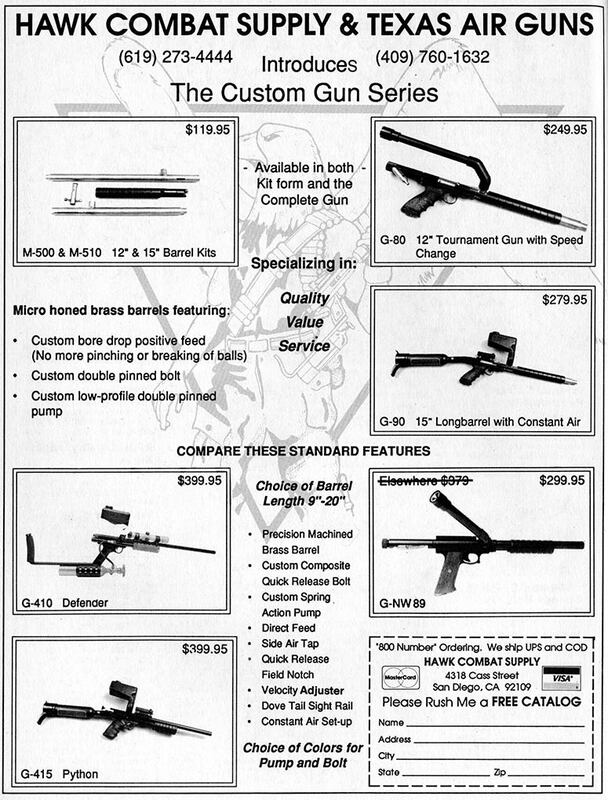 Page one of the Texas Air Guns write up in the September 1988 issue of Frontline. 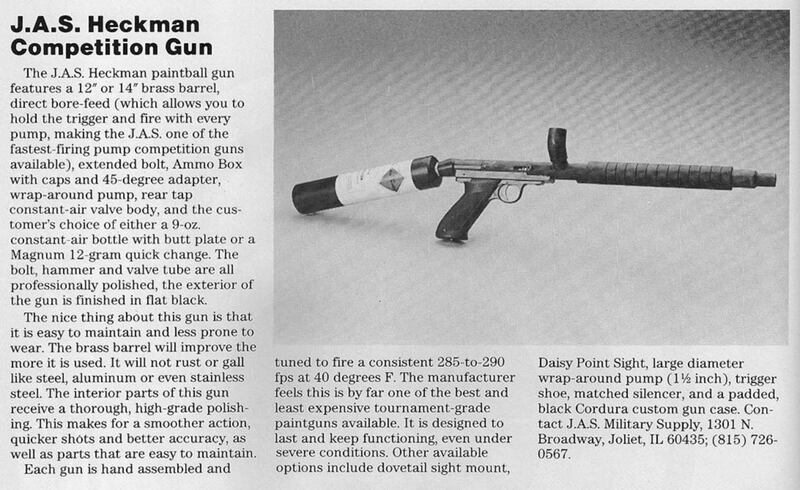 The above article, which appeared in the 1988 issue of Frontline shows the earliest TAG breech drop kit and was written by D. Heckman. Heckman also wrote a similar article for Action Pursuit Games around the same time. 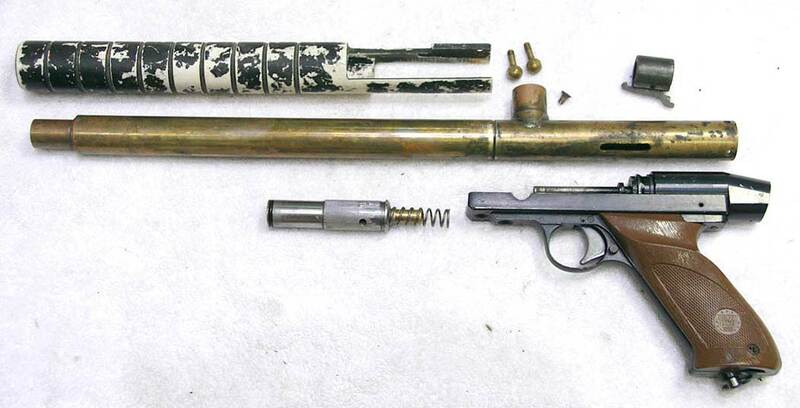 The Brass Texas Air Gun Breech Drop Body kit was first a stand along body and later offered with a pvc pump arm. This body kit dropped directly onto a stock Nelspot 007, replacing the stock class body with the brass body. No other parts were needed to convert a stock horizontal feed 007 into a direct feed paintgun. 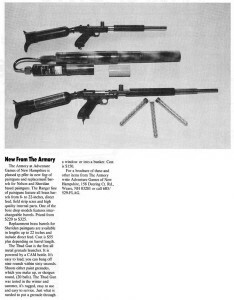 Page two of the Texas Air Guns write up in the September 1988 issue of Frontline. The Tag Breech drop kit uses a one armed pump to move the stock Nelspot Breech drop bolt back and forth. The Breech drop style bolt pushes the paintball out of the breech into the smaller id bore of the barrel. I believe this body kit was made from 1987 until 1989. Left side photo of the Breech Drop Tag Body kit with PVC pump handle. The feed and pump handle on the Breech Drop Nelson body kit. A Right side photo of the direct feed used on the Breech drop Tag model. •Soldered on Direct feed. 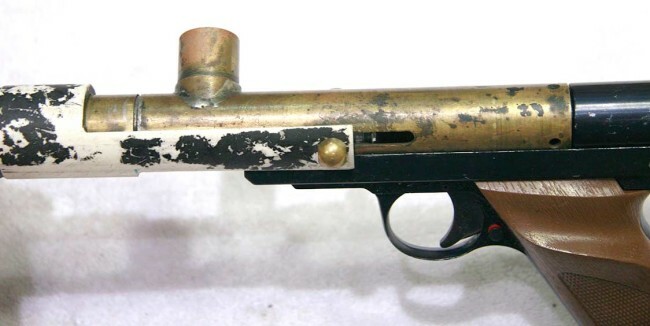 The Breech Drop model has the feed over the front of the frame. The Bore drop model has the direct feed further forward and is notched for the right side arm. 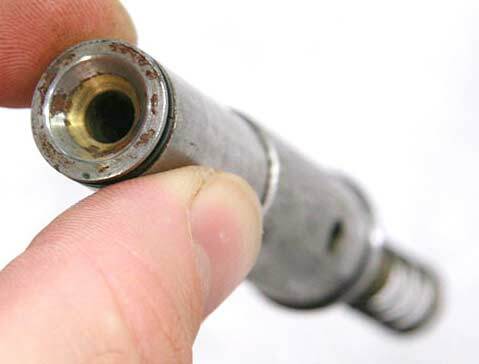 Since no pump handle needs to bypass this feed on the right side of the breech drop kit (on the body shown above) there is no need for a notch. 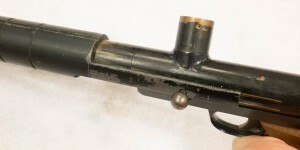 Side view of the PVC pump handle on the Tag Breech drop nelson. Stepped tip at the end of the barrel on Tag. Also, a notch in the pump handle is the same as PS-15 Marauder pump. Notch in the top of Pump handle is shown. •PVC Pump handle with a sighting notch in the top. This pump handle is very similar to the pump handle used on the PS-15 Marauder. End of stepped barrel on the Breech Drop TAG Nelson. 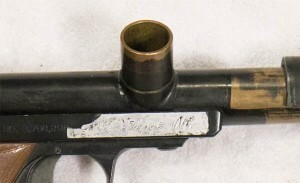 Side view of the stepped barrel on the Tag Breech drop Brass nelson barrel. 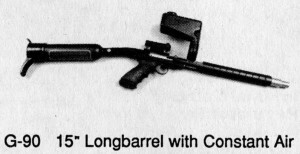 •Stepped Barrel tip. 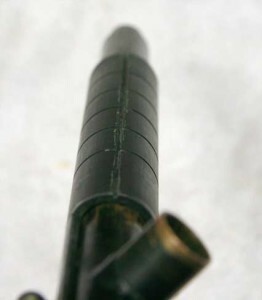 The tip on the barrel on the Breech and Bore Drop bodies is identical, which suggest a similar, or the same, method of construction. Close up of the ad scanned from the Spring 1989 issue of “Paintball” magazine, which shows the J.A.S. Heckman Competition Brass Bore drop model. In 1989 a Brass Bore Drop body of similar construction was introduced. This is where the name of the body kits becomes confusing, since there are between three and five different paintgun names printed in magazines articles and advertisements. But all of the brass body kits appear to be the same bore drop body, just rebranded with various companies name. Break down of Bore drop Tag/Heckman/Performer. Notice longer bore drop bolt. The Bore drop body kit consisted of a brass barrel, the dual sided pump, and a Bore drop bolt. The kit pictured above uses a anti kink bolt so it would need a stock nelspot hammer that has the center inner diameter opened up. Bore drop Bolt with brass anti kink adjuster fixed in place. Side view of Bore Drop bolt. The odd bolt used a typical bore drop outer diameter nose to push the paintball in the breech but used a center outer diameter that was a litter smaller with only the sear ledge being the full breech outer diameter. 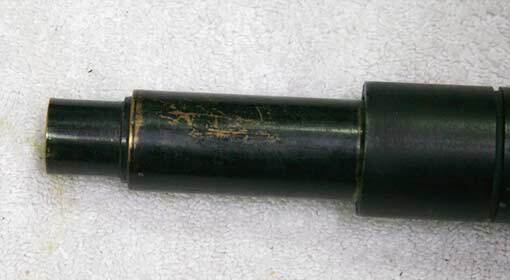 This bolt used a Brass anti kink interior shaft which was not adjustable and was likely press fit or soldered/braised in. Earlier versions likely lacked this anti kink back end. Left side full view of Bore Drop Tag/Heckman/Performer body kit. The pump handle and body were of similar construction to the Breech drop Texas Airgun kit. Stepped barrel on Bore drop model is identical in construction to the Breech drop Tag Brass body kit. •Stepped barrel is constructed exactly the same and soldered in front of the breech and on the steps as the Breech drop body. 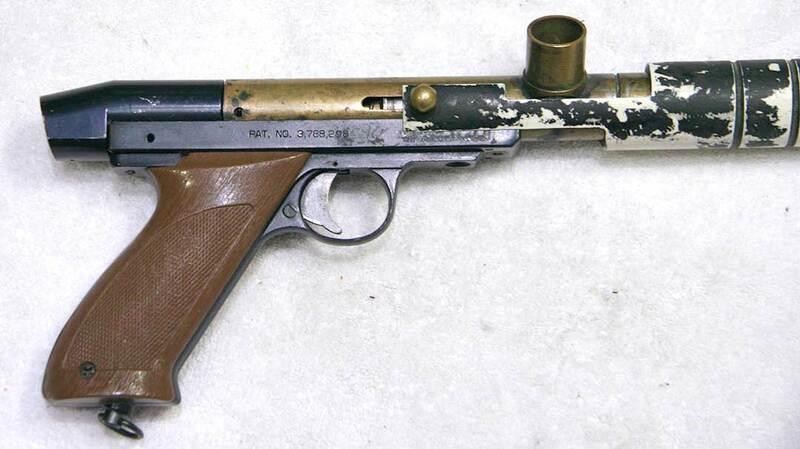 Another view of the stepped barrel and PVC pump handle on the Bore drop brass nelson. •PVC pump handle is very similar but lacks the sight notch on top. Ribs are spaced closer together. Left side view of Pump handle and feed on Bore drop Tag model. •The PVC pump handle is cut from PVC. 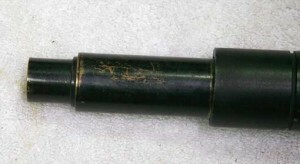 Right side view of Bore drop Brass Nelson. Notice the clearance on the feedneck needed for the right side arm to pass the feedneck. •Dual pump arms (left and right). Top vide of feedneck on Bore drop Tag/Heckman/Performer. Feed looks very similar to the Breech drop mode. •Direct Feed Neck on the Breech Drop body kit looks close to identical and is soldered onto the body at the same angle. Notch out of feedneck on right side of the Bore drop Tag/Heckman/Performer. This notch provides clearance to the pump handle. Pump handle removed in this photo. •Notched Feed Neck to allow clearance for the Right side pump handle. 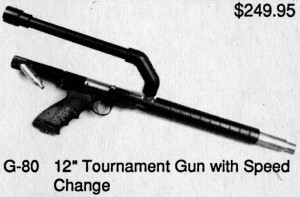 Ad scanned from the Spring 1989 issue of “Paintball” magazine. Brass Bore drop model is titles as J.A.S Heckman Competition model. •Joliet Army Supplies (J.A.S.) Heckman Competition Gun. Joiliet, Illinois, is the same town where CPX is located and Living Legends takes place. 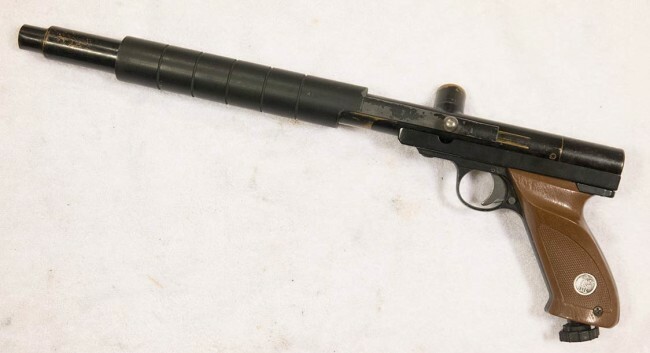 D. Heckman is also the author of the Frontline new product write up for the Texas Air Gun breech drop body kit so it’s possible he was also the producer. 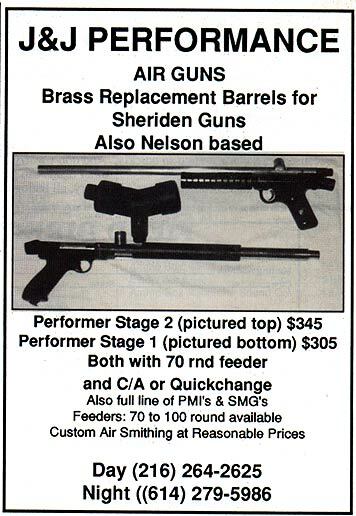 Spring 1989 scan from “Paintball” Magazine shows the Brass Nelson Bore drop guns are clearly labeled as TAG Nelsons in the Hawk ad by Carey Snodgrass. 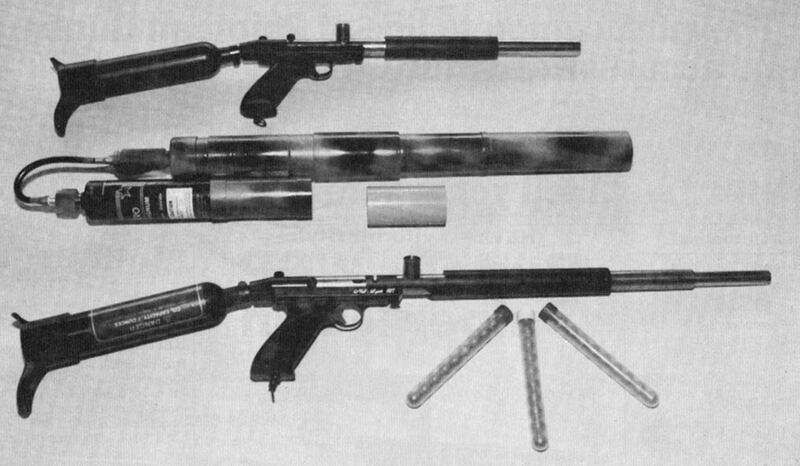 Hawk Combat Supplies in San Diego also distributed the later bore drop body kits. Hawk, which later became California Paintball Supplies, was run by Carey Snodgrass, who played on Navarone and later went on to captain team Top Gun and manufacture and market the Top Gun Pump. Hawk also offered brass barreled Sheridans, which look similar to early RTP/Paintball Pro Shop markers (also in San Diego). A close up on the 12 gram equipped TAG body kit advertised in the Hawk Combat Supplies ad. Constant Air direct feed Longbarrel Texas AirGun body kit as advertised by Hawk in the Spring 1989 issue of “Paintball” magazine. 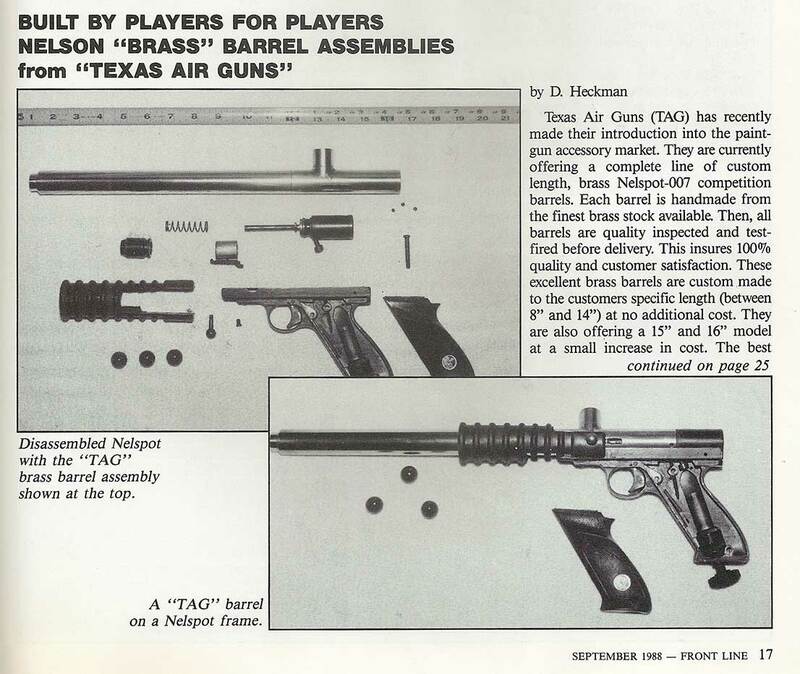 Hawk marketed their Bore Drop Nelson body kit as the Texas Air Gun kit which likely proves the bore drop kits were originally sold and manufactured by Texas Air Guns. 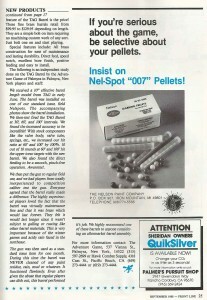 J and J ad for the Nelson based Performer Stage 1 and the Sheridan based Performer Stage 2 body kit. I believe this image came from Chris Mader’s image archive. I don’t know which magazines this advertisement ran in. 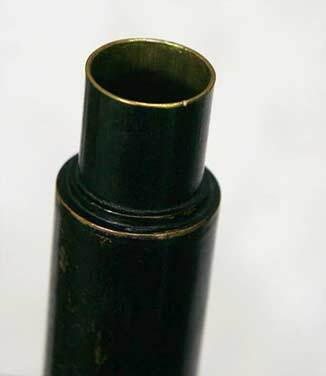 J & J Performance marketed a replacement brass barrel named the Performer Stage 1. I’m not sure who replied to my email, but I think the person replying was referring to Joe West. I also asked Dale Hilton about the Nelson body kits. Dale worked for J and J, and Joe West, before making his own barrels as Barrels of America (BOA). The Ranger Line, sold by Adventure Games of New Hampshire. Scanned from the February 1990 issue of Action Pursuit Games. And Adventure Games of New Hampshire marketed the TAG paintguns as their Ranger Line. 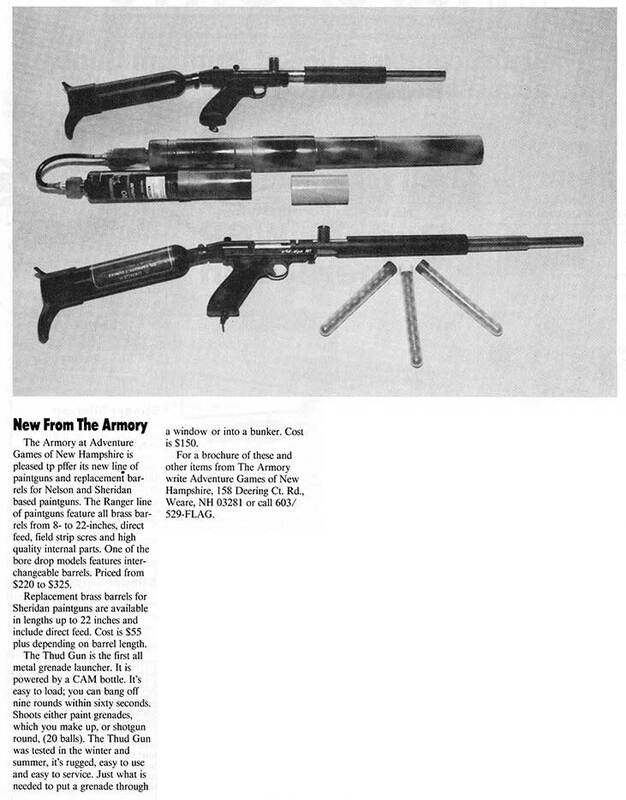 Their advertisement is unique because it shows both the earlier Breech Drop and later Bore Drop Nelson based paintguns beside each other. Left side of long barrel Brass Bore drop body kit. This kit came from Gabriel Tyler and the barrel is 20.5 inches long. Above is a neat Bore Drop example of these barrel kits, which I purchased from Gabriel Tyler back in around 2003. This paintgun has all the listed bore drop features including the stepped barrel end, breech drop bolt, PVC pump arms, and notched feed necks. Right side photo of the Breech Drop Tag Body kit with PVC pump handle. 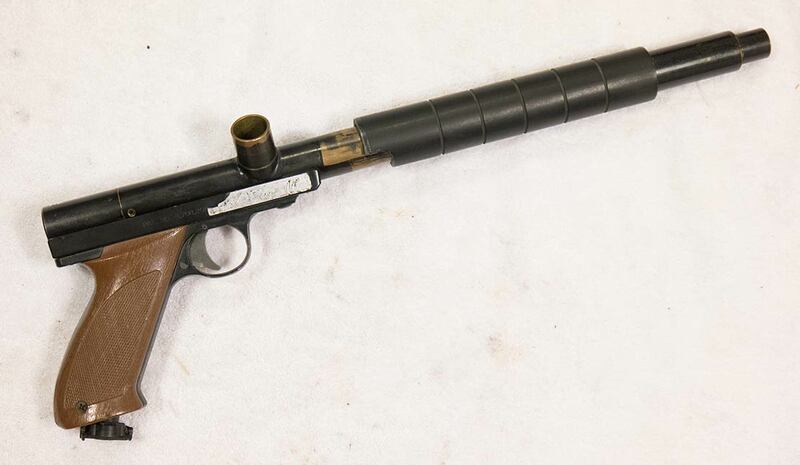 Texas Air Gun Breech Drop body kit with possibly cut down end of barrel? Notice the seam in the center of the barrel where the pieces were soldered together. And another Tag body kit in Breech Drop that is empty but will drop onto a Nelspot 007. Right side full view of Bore Drop Tag/Heckman/Performer body kit. And one of the Bore Drop kits assembled that has been pretty well used. Another paintgun which should be included in this list is the later Hawk Nelson which featured a removable barrel. This Nelson was market by Hawk in San Diego and released slightly later than the ad featured above. Unfortunately I don’t have any media illustrating this nelson but it is different enough that it wouldn’t easily be confused with the Texas Air Gun models. If anyone knows any more information on D. Heckman please post or email. A long body Lapco Spirit that Colin Thompson built while working at Paintball Connection for Jim Campos. Campos remember buying this from Colin. A look comparing the hammers from and NW Comp and CMI Thunderpig P1 pump gun. Both are similar in shape and use a similar sear. In this series of videos I go over assembling and then breaking down a WGP Ranger and some of the modifications to parts. Dan, I have some thoughts on these. I have what I believe to be a J and J Performer stage 1. It has straight “riffling” down the barrel(why I think J and J) it is bore drop but the bolt is way longer than a standard bore drop bolt like Line SI. You can PM me on MCB (don’t check my email much)at snaparen. I have pictures of it on there.